For Armenia, the victory of thousands of peaceful protestors in April 2018 in forcing the resignation of the country’s president-turned-prime minister, Serzh Sarkisian, was a rare demonstration of the “people power” potency. And that success only continued, as opposition leader Nikol Pashinyan was then able to drive the incumbent ruling Republican Party from power and alter the Armenian political landscape irretrievably. Backed by an outpouring of popular support, Pashinyan was able to assume the post of prime minister, as the parliament, which remained under the control of the now embattled Republican Party, was pressured to go along. However, Pashinyan quickly moved even faster and further, pushing through an agreement for a snap election for a new parliament in early December. With the parliament as the last bastion of power for the embattled Republicans, an early election was an astute move by Pashinyan, aimed at capitalizing on both his own political momentum and the rapid decline of the formerly ruling Republican Party. And despite holding power for over a decade, the election saw the largely discredited Republicans unable to even pass the threshold to remain in the new parliament. Although Pashinyan easily returned to a second, more lasting term as the prime minister, the sweeping victory of his “One Step” party in the election was somewhat tainted. More specifically, repeating an informal tradition of one party rule, Pashinyan consolidated his dominance of the new parliament, as his party secured 88 seats in the new 132-seat parliament, with only two other political parties, “Prosperous Armenia” and “Bright Armenia”, able to garner representation in the new parliament, wining 26 and 18 seats respectively. Yet the outlook for Armenia is neither as promising nor as positive as those impressive accomplishments would suggest. With a largely inexperienced new government, and in the face of dangerously high public expectations, the coming months will be crucial tests of leadership and political prudence. And as impressive as the forced resignation and defeat of the old regime was, the real demands of governance, including the necessity for compromise and concession, represent much more daunting and difficult challenges for Armenia. At the same time, foreign policy issues cannot be ignored for long, and are bound to exert political pressure and pose tests of resolve for the new government. For the Pashinyan government, the domestic agenda has always been the priority. Just as the wave of demonstration that swept them to power was never about foreign policy, the political ambition of the newly installed government remains shaped and driven by a perspective of a domestic reform. In part, this also stems from the recognition that foreign policy is not only a largely secondary issue, but is also a fundamental weakness, where the prime minister and much of his government have little experience. Although the foreign policy challenges, from the unresolved Nagorno Karabakh (or Artsakh) conflict to lingering tension with neighboring Turkey, are constant and consistent pillars of Armenian politics, the government’s real interest stays clearly centered on deepening democracy and reforming the closed political system. But even with domestic issues serving as such policy priorities, the government is hindered and even threatened by much more than inexperience. For example, the country is still plagued by institutional weakness and vulnerability. The weakness is most evident in the lack of a truly independent judiciary, and a related absence of a real rule of law. And the vulnerability stems from a new parliament that has little if any legislative or regulatory knowledge. The unprecedented transformation of the country’s system of governance, for instance, from a presidential to a parliamentary form of government is especially daunting as more than three-quarters of the recently elected members of the parliament are first-time deputies and first-ever legislators. Despite the energy, enthusiasm and sincerity of this group of new parliamentarians, the learning curve will be steep and will take time. But given the dangerously high and sometimes unreasonable expectations from most of the population for immediate benefits and improvements to their daily lives, time is the one commodity in short supply. On a broader level, there is an added pressure of time for the government as well. This pressure is rooted in the economic reality of the necessity to advance the already underway fight against corruption, overturn the inordinate market share and commodity-based cartels of the previous oligarchic system, and establish a more level playing field for business. If these challenges were not enough, the country is also faced with another problem, which the government has done little to address, – troubling poverty, with one out of three Armenians living in official poverty. With an added constraint of an overall Armenian investment climate that is now threatened by the lack of investor confidence, the economic outlook for Armenia remains rather bleak. Such a gloomy forecast is also based on the limits to growth imposed by external constraints, including closed borders, a weak manufacturing base and the readjustment of the country’s natural directions of trade that was driven by Armenia’s membership in the Eurasian Economic Union (EEU). The latter factor is especially serious, as a set of initial exemptions from the higher tariffs required by the members of the EEU are due to begin expiring in the coming few years. The necessity for adopting higher trade tariffs to confirm to the EEU standards will apply to some 800 Armenian goods and products, triggering an obvious blow to the Armenian economy. Moreover, this impact may be further exacerbated by the lack of a government strategy to manage or at least mitigate the economic harm from such a move. To date, the Armenian government has not yet decided whether to fight the expiration of the exception and seek to renegotiate, or to formulate a plan to counter the economic impact on exporters. Beyond the Armenian government’s clear preference for concentrating on domestic reform, pressure from foreign policy issues will only intensify. One notable example is the peace process over the Nagorno Karabakh (Artsakh) conflict, which has surprisingly accelerated in recent months. Despite expectations of continued diplomatic stalemate, it has actually been Azerbaijan that has set the faster pace for mediation, seemingly moderating its previous policy. More specifically, Azerbaijan has apparently discarded its previous maximalist position and has offered a fresh position defined more by moderation and reasonable engagement. Yet this may be more of a tactical adjustment than a deeper strategic shift, and may be a part of a more sophisticated test of the Armenian government’s inexperience in negotiating with Azerbaijan. Nevertheless, given the lack of any real progress in recent years, the more positive environment of the peace talks can only be welcomed and encouraged. For the Armenian side, however, the risk of moving too far too fast on the Karabakh issue has already triggered a backlash of concern, both within Armenia and Nagorno Karabakh itself. The prime minister’s lack of any credentials either as a wartime leader or as a hard-line nationalist tends to only exacerbate such mistrust and concern, leading to rather incredulous charges of “dangerous concessions” and “betrayal”. But endowed with now well-establish political legitimacy and popular support, the Armenian government will likely fend off such concerns, and continue to maintain engagement in seeking a diplomatic resolution to the conflict. Thus, the broader context of Armenian foreign policy will only continue to be defined by the imperative for greater strategic balance. Such balancing will not be easy to accomplish, however, and will be largely contingent on the capacity of the Armenian leadership to manage its complicated, yet essential relationship with Russia. As part of this, the most difficult aspect will be to more adroitly manage Russian concerns and downplay the dangerous precedent that Armenia’s “people power” victory represents for Moscow. At the same time, Armenia can be expected to continue pursuing the new strategic opening and opportunity from its position as a member of the Eurasian Economic Union (EEU). 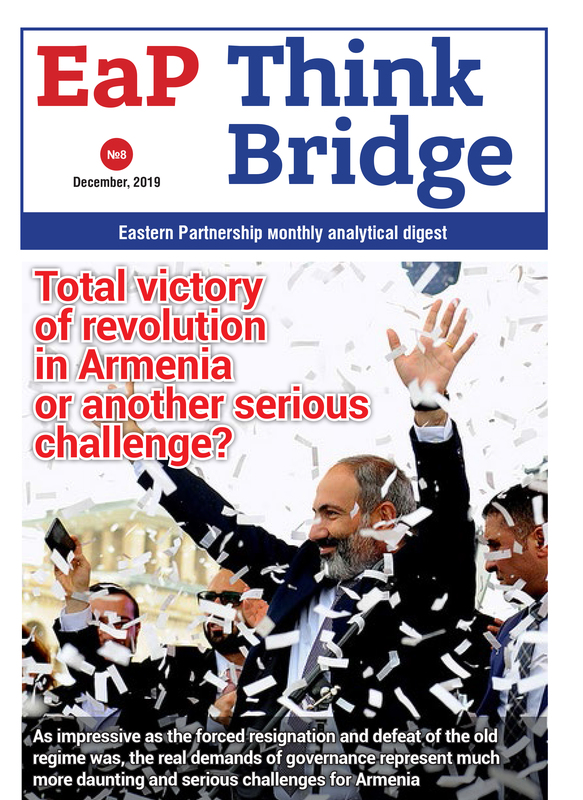 That opportunity rests on Armenia’s capacity to present itself as a “bridge” between the Eurasian Economic Union and the West, and with the European Union (EU) more precisely. The potential bridging role is bolstered by the geographic position of Armenia, which despite lacking any land borders with the EEU itself, offers alternative avenues to leverage Armenia’s relations with Iran, proximity to the Middle East and even interest in the possible benefits from the possible reopening of its closed border with Turkey. In addition, and perhaps more importantly, Armenia can also exploit the need for the Union to garner greater legitimacy and credibility, stressing Armenia’s Comprehensive and Enhanced Partnership Agreement (CEPA) with the EU as an avenue for institutional engagement and cooperation between the Eurasian Economic Union and the European Union. And for a small state like Armenia, its foreign policy is more nuanced and sophisticated than it seems. This is demonstrated, for example, through the application of a four-pronged course of deepening political and economic ties with the European Union, sustaining its close links to the United States, developing trade with neighboring Iran and seeking to manage its over-dependence on Russia, its primary trade and security partner. The latter factor stems from Armenia’s unique role as the sole Russian ally in the region. After all, Armenia is the only country to host a Russian military base in the region, and the one country of the South Caucasus with membership in both the Russian-led Collective Security Treaty Organization (CSTO) and the EEU. Simultaneously, in order to attain such greater strategic balance, Armenia has also pursued an uncharacteristically subtle and stealthy pursuit of engaging China. While this “Eastward embrace” seems surprising, given the disparity in size and remote connections between Armenia and China, it does conform to both Armenian and Chinese interests. For China, the small country of Armenia is recognized as a stable and promising element of a much larger landscape, whose position at the intersection of the Caucasus and the broader Middle East offers a more pivotal bridgehead for China. Although Armenia is far too small and remote to garner individual significance for China, as part of this bigger picture, the country has appeared on the Chinese agenda of expanding trade and infrastructure, thereby, enhancing China’s influence and prestige. From the Armenian perspective, the appeal and aspiration of drawing closer to China stems from a combination of opportunities in the future, driving Armenia to position itself early in a scramble to be included in China’s Belt Road Initiative (BRI). The appeal of Chinese capital investment in infrastructure is already evident in Armenia’s “North-South” roadway, a project launched by the Asia Development Bank (ADB) designed to provide “inter-connectivity” by extending and modernizing the Armenian highway network to Georgia in the north and to Iran in the south. The outlook for Armenia’s strategic embrace of China and its pursuit of further deepening its military ties to China face a potentially serious challenge, however. That challenge stems neither from Yerevan or Beijing, and, interestingly, not even from Washington. Rather, it may be Moscow that will come to resent being upstaged by a new rival. Yet China’s presence and position in the South Caucasus remains far less than other regional powers, in contrast to Russia, Turkey and even Iran. And given the limits of Chinese interests in the region, it seems unlikely that China would seek to challenge Russia for dominance. Nevertheless, Moscow has been watching Beijing closely and with a degree of trepidation. Although Russia remains Armenia’s most important security partner, for the Armenian government, the country’s pronounced over-dependence on Russia necessitates a course correction, based on garnering greater balance. However, this engagement of China may still work for Armenia, as ties to China are still more acceptable and less threatening to Russia than any Western embrace. The outlook for Armenia depends ever more on the performance and prudence of the government. First, the Armenian government needs to move fast to deliver results, with concrete outcomes sufficient to meet high expectations. But with the parliamentary election that was the first free and fair contest in years, the fact that this Armenian government is considerably and noticeably more democratic endows a greater degree of legitimacy than any previous administration. And from that greater legitimacy a new opportunity is derived to exercise political will, necessary to withstand unexpected challenges in the foreign policy. Although the external challenges, from Russia and over the Nagorno Karabakh (Artsakh) conflict perhaps, will endanger the government in its weakest areas, the statesmanship required to weather such a storm may once again be seen in the leadership of the Armenian prime minister, only matching his unexpected victory last year.